Dried apricots are one of Red River’s most popular offerings. In the retail market, they are used in trail mixes, snack bars, sauces, bakery products, as well as a separately packaged item. 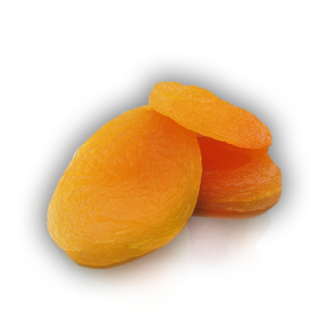 Apricots are high in fiber, containing four grams per serving out of an approximate 30 grams required daily. They are also a good source of Vitamin A, an important fat-soluble vitamin that plays a key role in maintaining eye health. Turkey is the world’s leading apricot producer. The Malatya Province is the center of the country’s dried apricot industry, renowned for producing the highest quality, sweetest apricots. Malatya apricots are perfect for drying because the pit is readily separable from the fruit itself. We source all of our dried apricots from Malatya where we maintain an office staffed with local representatives who ensure product quality, from buying, to processing and packaging. Our apricots are hand-picked, gathered, pitted, sulfated, and sun-dried for two days after which they are compressed and sun-dried for another two to three days before being sold to local processing plants. Sulfating preserves the natural color and extends the shelf-life of the apricot. We also supply natural or organic dried apricots, which are not treated with sulfur and take on a deep, rich brown color. These natural apricots have a very flavorful, sweet taste.